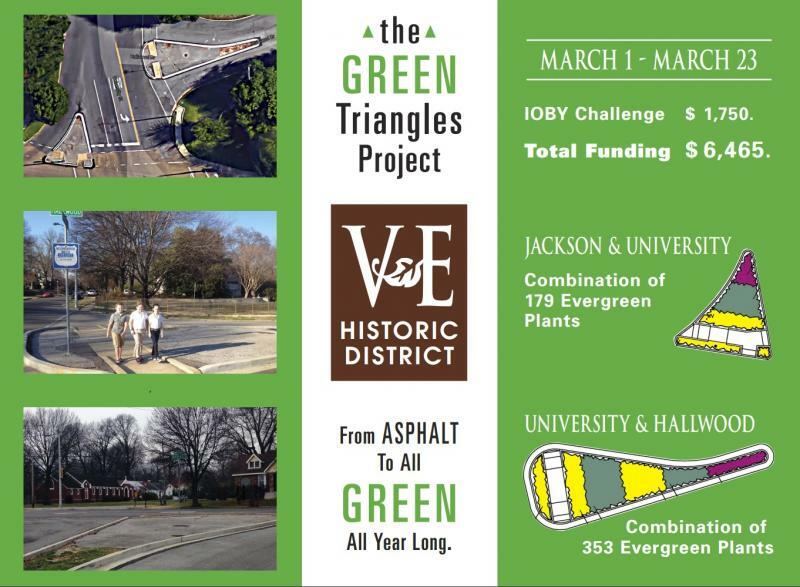 The Green Triangles Project will "green" and beautify two traffic islands at Univeristiy and Jackson streets in the Vollintine Evergreen neighborhood. Every day Janice and her friends walk to Snowden School from their homes in Vollintine Evergreen. They like to walk--except where they have to cross University and Jackson streets. Here, the cars and trucks whizz by, and the traffic triangles where they wait to cross are ugly and bare! Dog walkers, bus riders, and neighbors out for a stroll also notice how barren the asphalt triangles are compared to the green lawns and trees in the neighborhood. The great news for Janice and her friends is that VECA has launched an ioby campaign to Green the Triangles! You and other Vollintine Evergreen residents can make this project a reality by giving to the campaign between March 1st and 23rd, when ioby will match every donation 1:1 up to $150. If you give $25, ioby will match your donation so it becomes $50! If you give $50, ioby will match your donation so it becomes $100! Donate to the Green Triangles Project between March 1 and 28th. To learn more and for information on how to get involved, read on! The Green Triangels Project has not yet been “designed,” which allows you to provide input on the design! The steps that will be followed to design and implement the project are outlined below with some possible “alternative” approaches. Step 1: The fundraising team will plan the campaign. The timeline to raise funds for the ioby 1:1 match is March 1-23. Fundraising can continue after March 23, and if needed, we will continue the campaign until May 1st. Step 2: While funds are being raised, we will work with the city engineer's office to get project approvals. We hope the city can help by removing the asphalt and underlying substrate to allow fill to be put in for whatever project we determine is feasible. Step 3: Design the triangles. Several ideas have been advanced for the design. One idea is to make the larger University/Hallwood triangle a rain garden. This is a cool idea but will require more engineering and funding. A simpler and less costly approach could be adopted for one or both islands by removing the existing asphalt and compacted dirt, and re-filling with soil to a depth that can support drought-resistant plants that require minimal maintenance. Once we have a design, we can determine the cost and if needed, can raise any additional funds. Step 4: Develop the final budget based on the design. Raise funds to complete the project! Step 5: Get final approvals and implement project. Our "farthest out" target date for implementation is January-March 2017. Step 6: Letting people know what is going on and where we are will be an ongoing process throughout the project. The triangles reflect poorly on our neighborhood. We envision the triangles becoming attractive green spaces that enhance and beautify our community. Deadline Extended by ioby for Campaign! The only way way to describe the response to the Green Triangles project is AMAZING! We are so grateful to the generous donors who have given to the campaign over the last week. We are very close to reaching our goal of $6,000 and have progressed far more quickly than we ever anticipated. Meanwhile, ioby has extended the campaign deadline for Memphis projects by one week to March 28. Please spread the word to friends and neighbors. We will be distributing flyers this week on the streets around the triangles that have not been previously flyered (sic!). Another wonderful piece of news is that Ritchie Smith and Associates, the landscape architectural firm that has worked with the V&E Greenline to make improvements over the last year, has agreed to help us with a design for the triangles. We will also share/post the plans in the VECA newsletter, on the ioby website and at an announced meeting at the VECA office in future to get community input. Once we have general agreement on the design, we can go back to City Engineering for review and approval. And, once we have approval, implementation is the next stage! Thank you everyone for your hard work and generous support of this project! Three VECA neighbors met with representatives from the City Engineers office on Friday afternoon. The meeting was cordial and productive, and we learned what we need to do to get the project approved. The first step is to have plans drawn by a licensed engineer, landscape architect or surveyor. The plans must include locating underground utilities. The City Engineer's office will review and must approve the plans. They generously offered reach out to other divisions to see if assistance might be available for removing the asphalt. The filling, planting and ultimately the ongoing maintenance of the triangles will be the responsibility of the neighbors as we go from asphalt to "green." Thank you for getting us off to a great start! Thanks to all of the wonderful donors who have helped get the campaign off to an amazing start! We have a meeting scheduled to discuss the project with the City Engineer's office on March 4. VECA volunteers Andy Saunders and Cathy Marcinko will be meeting with them and wil update the Green Triangles committee at the next meeting on Sunday, March 6th at 3 pm. The committee meets every Sunday at the VECA Welcome Center at 1680 Jackson Ave. All who are interested are welcome to attend! Connie Shepherd, a Vollintine Evergreen neighbor, who is also the City Horticulturist, has offered to help develop a design for the green triangles! Thank you Connie! We are excited and thrilled to have you as part of the team! For nearby homeowners and organizations who can contribute this amount or whatever you can afford! The triangles are a gateway to the neighborhood, and if they are beautiful, it should improve property values! For area renters and VECA members who want to support the project because you care and because it will make our neighborhood more livable! For seniors and students who want to support the project. You are an important part of Vollintine Evergreen and thank you for supporting the project with whatever you can give. For anyone who wants to support the project--every dollar counts and will help us get to our goal. THANK YOU!! !